My desire for vegetables has been fleeting over the course of the first and second trimesters. Some days I don’t want to touch them with a ten foot pole (except in smoothies, maybe), but when I do get a craving for veggies I have to eat all the vegetables, as soon as possible. There’s no middle ground. I either make a salad the size of my head or no salad at all. 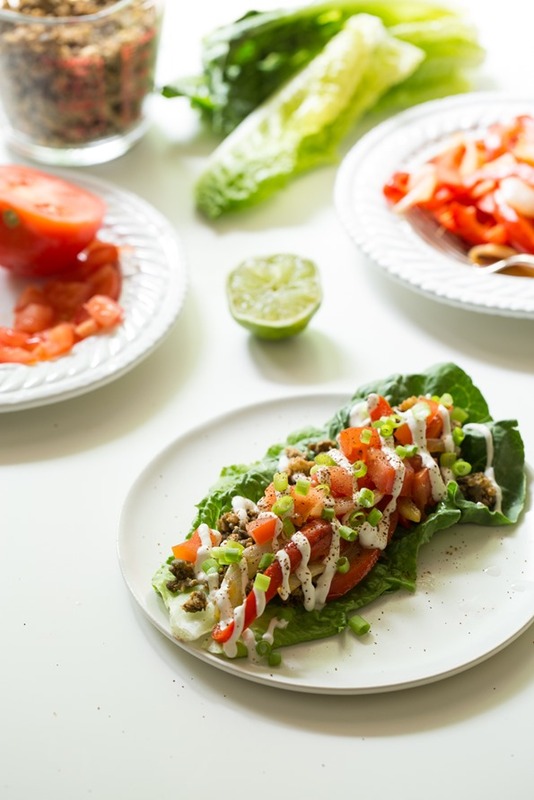 These lettuce-wrapped tacos are the result of one of my undeniable, all-consuming veggie cravings last week. All I could think about was something super fresh and crunchy. Before I knew it I was pulling every single vegetable out of my fridge and piling it onto the counter. Eric could see that crazy look in my eyes and he knew I would stop at nothing to get my fix. I whipped up the lentil-walnut taco meat from my cookbook, sautéed some red pepper and onion, blended up some cashew sour cream, and got to chopping. I knew this was going to be the veggie-packed meal of my dreams. I almost shed a tear of joy when I took my first bite. Heck yes. I hit the flavour, texture, freshness jackpot! Somehow I managed to share with Eric and we stuffed ourselves silly. Surprisingly, we even had leftovers for lunch the next day. I’m telling you, these tacos prove that leftovers can be a great thing. It was such a fun treat to open the fridge the next day and have this great lunch waiting to be gobbled up a second time around. Other topping ideas = sliced avocado, cilantro, hot sauce, _________ ? 6) Stuff into face. Make a HUGE mess. Repeat as necessary (until you can’t fit one more bite). Get ready to pack in a ton of veggies in one irresistible, healthy meal. 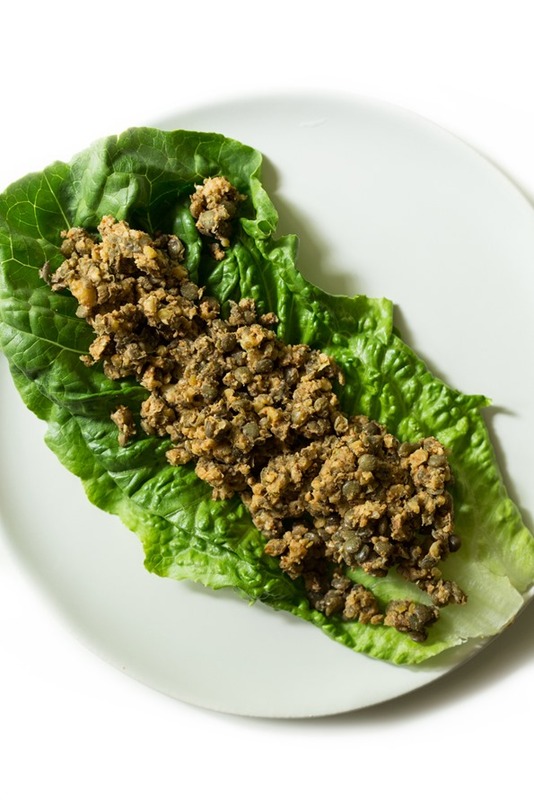 If you haven't tried my lentil-walnut taco meat, this is a great recipe to do so. 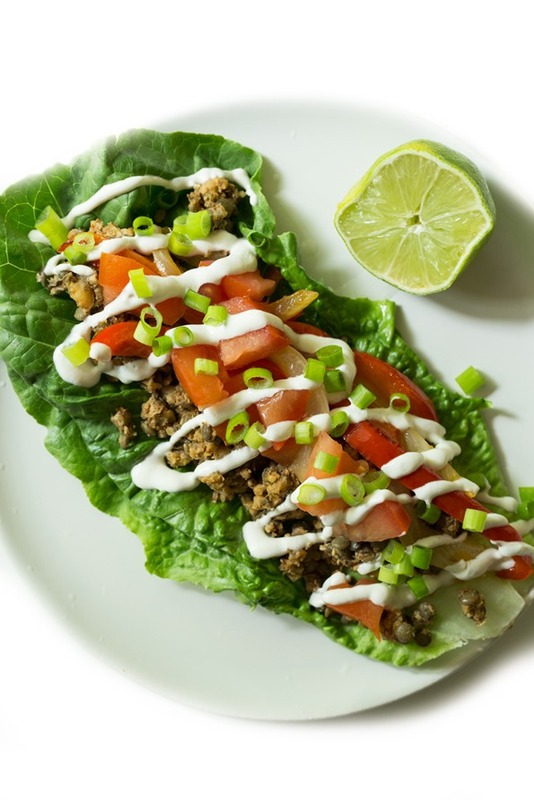 It's high-protein, and the taco seasonings and chewy texture create a realistic-tasting taco base. 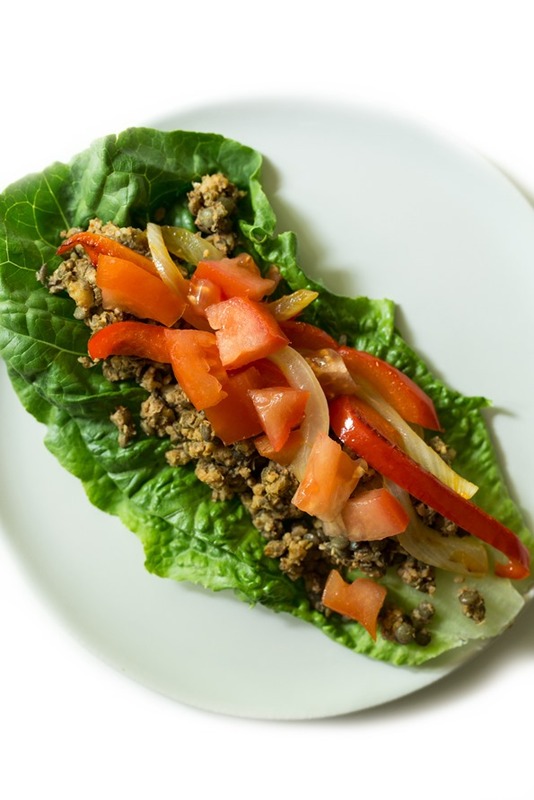 Feel free to use tortilla wraps or corn shells instead of lettuce wraps, or you can make this recipe into a big salad, too. You can save time by cooking the lentils and prepping the taco meat in advance. 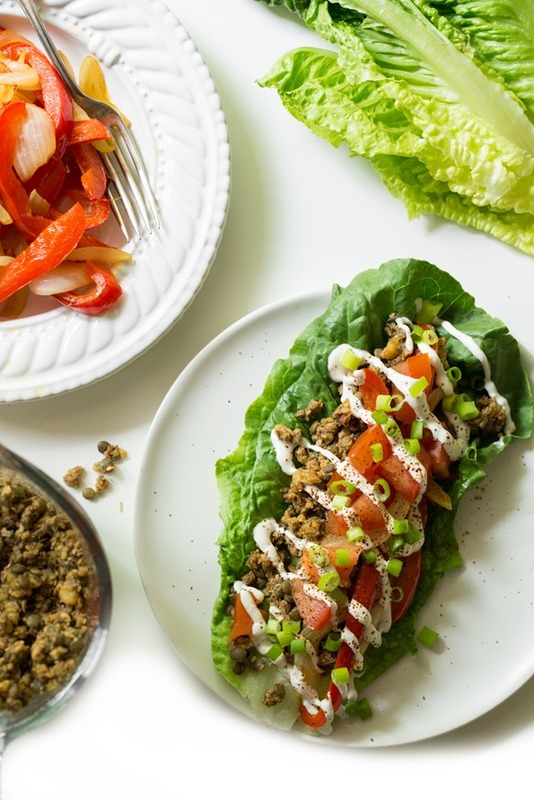 This recipe is inspired by Minimal Eats taco wraps and it's adapted from my Raw Taco Salad and the lentil-walnut meat is adapted from the The Oh She Glows Cookbook (page 186). Other topping options: Sliced avocado, hot sauce, cilantro, etc. Cook the lentils: Rinse lentils in a fine mesh sieve. Add to a medium pot along with a few cups of water. Bring to a boil, reduce heat to medium, and simmer for 20-25 minutes until tender (cook time will vary depending on the type of lentils you use - see package). Drain off excess water. Toast the walnuts: Preheat oven to 300F. Add walnuts onto a rimmed baking sheet and toast for 10-13 minutes, watching closely, until lightly golden and fragrant. Set aside to cool for a few minutes. Saute the pepper + onion filling: Add 1/2-1 tablespoon of oil into a large skillet or wok. Cook the onion and peppers over medium heat for about 15-20 minutes, reducing heat if necessary and stirring frequently, until translucent. Prepare the taco meat: Add 1 3/4 cups cooked lentils (you'll have some leftover) and all the toasted walnuts into a food processor and pulse until chopped (make sure to leave texture). Stir or pulse in the oregano, cumin, chili powder, and salt. Stir in the oil and the water until combined. Prepare the rest of your vegetable toppings and wash + dry the lettuce wraps. 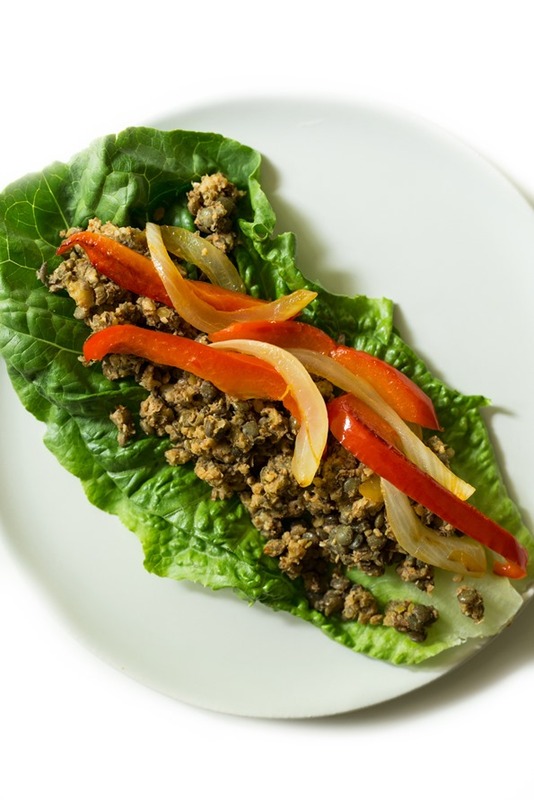 Assemble: Add a large lettuce leaf onto a plate, top with taco meat, sauteed peppers + onion, and the rest of your desired toppings. Leftovers can be stored in the fridge in sealed containers to be enjoyed the next couple days. The cashew cream will keep for at least a week in the fridge. 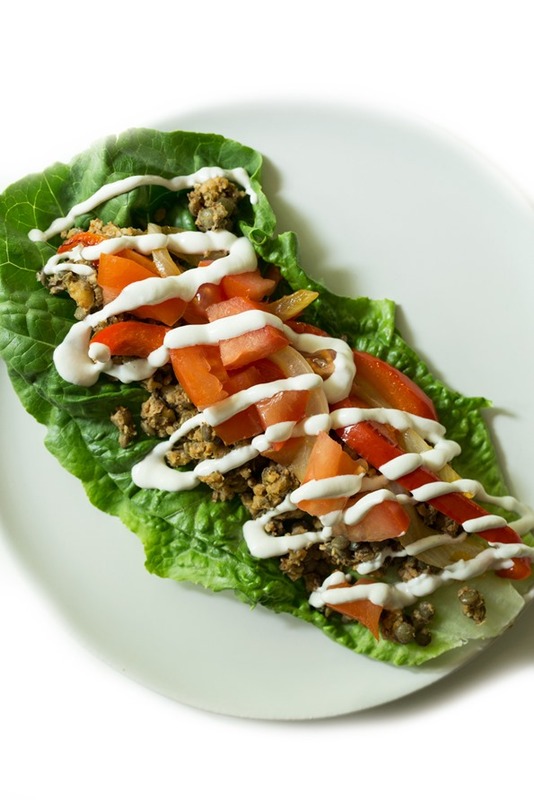 Use sour cream leftovers on sandwiches, wraps, stirred into salad dressings, on vegan nachos, or with chili or soup. 1) I used French green lentils in my taco meat because I love their chewy texture, but regular green and brown lentils work too. Do not use red lentils as they are too mushy and don't have the required chewy texture for this recipe. 2) Nut-free taco meat: I haven't tried this yet, but you might want to try subbing the walnuts for 1/2-3/4 cup toasted sunflower seeds. Let us know how it goes if you try it out! 3) My Cashew Sour Cream recipe can be found here.